Property / Street / Road: Below Rockside Hydro at the top of Wellington Street close to the tram depot. Date: Saturday 28 March 1914. Photograph published in The High Peak News on 4 April 1914. Below are quotations from the accompanying article. Description/Historical Information: Lighting the gas to fire the boiler of Matlock's new fire engine, together with a demonstration at 3p.m..
the face of one of the firemen can be seen behind Captain Nuttall. 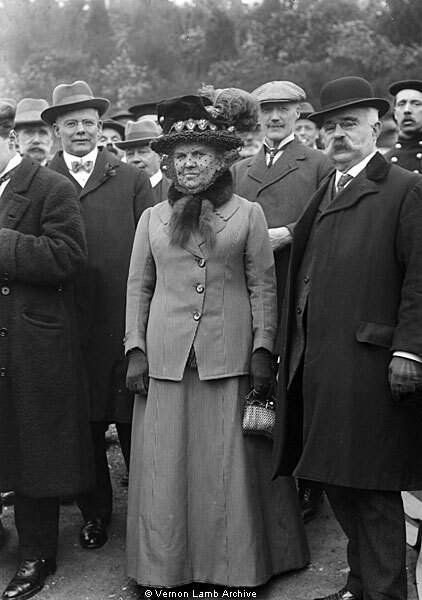 Mrs. Nuttall, who had badges in her hat, was to light the torch and then to light the fire in the engine. Time was then to be taken to raise the steam from cold water to 100 lbs. She was then to start the valve to turn on the water to the hose. See, in the Events Matlock section, VLA4947 | VLA4967 | VLA5186 | VLA5192 | VLA5218. Also see, in the Uniforms - Non-Military section, VLA4981 | VLA4983 | VLA4986.